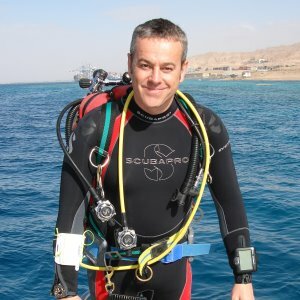 Rod Abbotson, PADI CD and TecRec IT at Dive Aqaba, has been a CCR diver for several years; he uses the Pelagian MCCCR for both pleasure and deep commercial dives. Rod has recently completed his Pelagian CCR instructor course with Pelagian I/T Mark Ellyatt. After the training course Rod joined Mark to complete some dive computer evaluation dives at both 90 metres and 120 metres for twenty minutes bottom times. Dives of this nature are almost beyond safe open circuit scuba limits but each diver used just 80 bars of diluent from their S30 (4.5l) rebreather tanks after the 3 hour + decompression. The photo is of Mark not me!